Danze 15" Chrome Right Angle Wall Mount Shower Arm and Flange: This Danze 15" Right Angle Shower Arm & Flange is built to last. The highest quality standards are used to precision manufacturer a top of the line fixture. Important features of this 100% BRAND NEW Fixture: Complete Item! Everything necessary for installation is included. 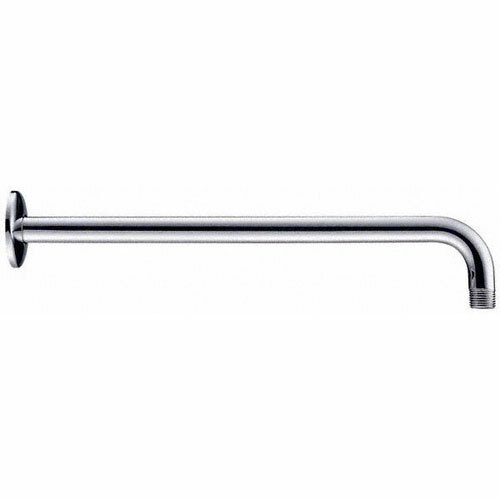 Chrome Wall Mount Shower Arm and Flange - 15" Right Angle Shower Arm w Flange - To complete your Shower setup, Danze offers a variety of Shower arms in all different shapes and sizes. Take the Danze 15 in. right angle Shower arm with flange for example. All are easy to install and will compliment a number of Danze Showerheads. - Solid brass construction for durability - Will work nicely with Danze Showerheads - Chrome premier finish designed to resist fading and tarnishing. - Easy installation - Seamless mounting along wall - Matching Accessories Available - Easy to Install - Installation instructions included. This fixture is manufactured by Danze and is part of their 15" Right Angle Shower Arm & Flange collection. To complete your Shower setup, Danze offers a variety of Shower arms in all different shapes and sizes. Take the Danze 15 in. right angle Shower arm with flange for example. All are easy to install and will compliment a number of Danze Showerheads.